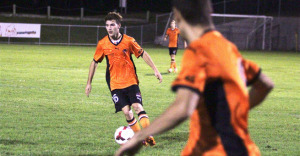 Brisbane Roar NYL recorded their first win in three matches by defeating Western Pride 1-0 at Briggs Road Complex on Saturday night. Striker Shelford Dais scored the only goal of the match early in the first half for Roar, consigning Pride to their third straight defeat. Less than five minutes later, Roar found the back of the net with Dais wriggling past two Pride defenders to angle a low right footed shot past Pride goalkeeper Andres Pascoe. Shortly after, Mitch Hore’s shot for Roar was cleared by Will Jordan before Pride forward Peter Drager tried to respond for the home side with a blistering run down the left but couldn't angle the ball back. Roar dominated the midfield contest and Hore soon teed up Dais, who shot wide of the target. Pride pushed up the pitch and were nearly back in the contest as Milan Sekulic and Drager both sent shots wide of the target. Dais thought he’d netted his second from a free-kcik as half time neared but the goal was overturned for offside. The second half began with Sekulic sending a shot straight at Roar goalkeeper Fraser Chalmers before Soo Myeong Lee shot wide of the target with a powerful effort. Sekulic demonstrated his pace again by out sprinting his marker down the left to set up Chris Scott, who shot over the bar. Scott looked to rectify his miss soon after but directed his shot at the keeper. He then set Drager up from a cross but the striker headed wide. Roar sought to seal the points as substitute Yango’s powerful right-footed strike forced Pascoe into a diving save. Yango was again in the thick of things in the closing minutes with a forceful shot that ricocheted off the cross bar before Yandi Munawar shot wide from the rebound. The result leaves Pride with only two wins and in second-last place as the season approaches its half way point, while Roar remain third in the standings.